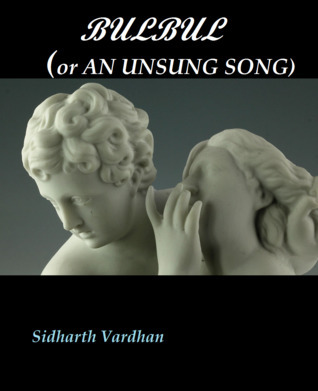 Bulbul or An Unsung Song is a debut book by Sidharth Vardhan. The plot of the story based on Byblis Greek mythology from Ovid's Metamorphoses where a girl falls in love with her brother. It is a story of unfulfilled desires and social foundation. Bulbul is an eight-year-old girl living at her uncle Manohar's house in India. Her mother Sumitra and father Shikhar got divorced. Their son ten-year-old Gulab lives with Shikhar in the US, and Bulbul with Sumitra. The Bulbul is a stubborn and lonesome child. She had a pet named Mr. Cute, and Sally, an imaginary friend. Things going perfectly until Gulab came to India to live with them permanently. Bulbul was very happy. Now she has someone to play with but for Gulab the situation is different. Their mother Sumitra suffered from a migraine. She gives no time to their children. Manohar, an alcoholic, trying to run from his inner demons. Soon Bulbul grew feelings for his brother. The story narrated by Bulbul POV. I can feel a different kind of emotions for Bulbul. But in the end, I can only disgust her. She has only one obsession in her life, to sleep with her elder brother. She left with no family or friend. Love is a beautiful feeling, but everything has its limits. The author didn't justify with her character. In starting, I thought the author choose a different, and cumbersome subject. But soon I realized that the mistakes in this book make it a waste of time. This book needs serious editing. There is not a single page in the whole book where I can't see the spelling and grammatical errors. Even the author or editor of this book changes the name of the character at one place, and in another place, a character name Divya is written as Divyasa or something. It breaks the flow of reading. The author talks to the readers in the middle of the story by saying that don't judge my character Bulbul. This type of instances happened throughout the story. You can't tell your reader these things. The narration is poor. There is a misuse of a passive voice. The character names are old and boring. Sidharth Vardhan gives two names to the story which is again a bad decision. The cover of the book is not intriguing. It is one of the worst read of this year for me, and I am shocked at how this book is overrated on Goodreads. Not a single reviewer point out the errors. I will not recommend this book to anyone ever. There's a long, long way to go for the author. A coming-of-age story of a young girl based on the story of Byblis from Ovid's Metamorphosis. Bulbul is a very sensitive child - and has had a lonely life, the two aspects are brought out in a few scenes and chapters. Her parents divorced when she was two. And so, she lived with her mother at her uncle Manohar's house, separated from her father and brother. Her mother won't let her leave the house being too protective of her. When Bulbul was an eight-year-old dreamy child, her father decided to marry again which caused her ten-year-old brother, Gulab, to come to India and live with his maternal family. The two children developed a bond but for Bulbul, the bond was far stronger and, as she came to discover over years, of a different form. The discovery struck her with guilt and strong fears of discovery on one side and wishes for the fulfillment of deepest desires on the other hand. While following the lives and thoughts of its characters, the book makes the statement on the general condition of the Indian society. Bulbul's strange fate makes her question the morality of the very traditions by which she finds herself imprisoned.